Home to the global headquarters of Eastman, Kingsport is also a great place for business enterprise. The city has enjoyed tremendous growth and development with more than $3 billion in business investment in recent years. “Tennessee’s Bright Spot” embodies an ideal example of how rural and metro lifestyles can flourish side-by-side. An economic hub of a proud, historically significant region of the United States ['The Mountain Empire'], the city of Kingsport and its surrounding area have capitalized on a temperate climate, abundant natural resources, and a capable workforce to create a fulfilling, affordable, and accessible quality-of-life on every level. Making care to its citizens top priority, Kingsport’s community services are available to you by simply dialing 211. You’ll quickly be connected to Contact-Concern [sponsored by United Way], where you can either find help or give help to those in need. The Tri-Cities Regional Airport offers convenient local access to worldwide destinations. Just miles from Kingsport’s downtown, you’ll be on your way in no time. Temperatures here in Kingsport are delightfully mild year-round [averaging 66 degrees Fahrenheit], and our temperate climate affords a spectacular display of all four seasons. Need to update or renew your Driver’s License when moving to Kingsport? Click here for Tennessee State Resources. 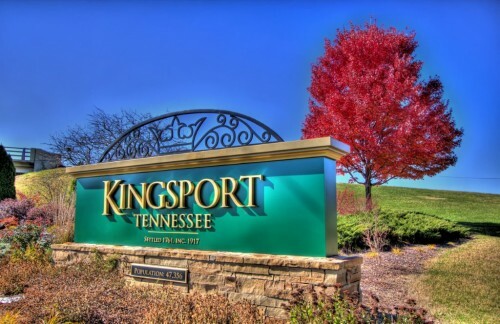 Officially chartered in 1917, Kingsport [notably, the only city with this name in the entire United States] derived its moniker since in 1774 from an early boatyard here on the Holston river known as “[Col. James] King’s Port.” Alternately known as “The Port Of Kings,” the “King of Sports,” and the “King of Hospitality,” it’s a glorious place to call home by any name. Kingsport offers its residents outstanding opportunities for both primary and secondary education. Kingsport City Schools, comprised of eight elementary schools, two middle schools and one high school, is committed to providing excellence in education for all students. When you’ve decided to make our bright city your new address, these utility providers will arrange all the necessities to provide for the comforts of home. The Kingsport Convention and Visitors Bureau’s web site is a great place to explore what’s happening in our bright city. These employment agencies offer numerous occupational possibilities for you to explore, whether you’re looking for a quick start to your job search in here our bright city, or you’re simply in need of temporary work. Become part of the exciting advanced manufacturing workforce by learning new in-demand, hi-tech skills needed for today’s high-paying jobs. Northeast State Community College’s Career Development Services team is ready to help, and the services are free. Entrepreneurs thrive in our bright city through KOSBE [The Kingsport Office of Small Business Development & Entrepreneurship]‘s financial assistance, counseling, and other free resources. Whether you’re headed to Kingsport from across the state or across the country [or anywhere else in the world, for that matter], these businesses pledge that you and your assets will be handled with care. Planning an extended stay in Kingsport, but not a permanent move? Depend on these resources to get you settled comfortably while you’re here… and know that we think you’ll be impressed enough to one day choose “Tennessee’s Bright Spot” for good. Contact Lara Potter at lpotter@visitkingsport.com or 423-392-8821 for information on flexible leasing opportunities. When it’s time to relocate, where will you store your most precious posessions? Whether you are moving your business or your home, or both, choose a safe, secure, climate controlled space with easy access and loading dock accessibility. Kingsport is proud of the abundant opportunities offered to worship here in our city. “Tennessee’s Bright Spot” is proof that you don’t have to wander far from home to earn a high-quality education you can be proud of. Our higher-learning institutions offer specialized, respected training for a wealth of careers. With a focus on preventative care and state-of-the-art technology and support, Kingsport’s forward-thinking health-care professionals are leading the way to healthier, more enjoyable living. Whether it’s competitive swimming, water classes or waterpark fun, the state-of-the-art Kingsport Aquatic Center is unlike any other attraction in the region. Get ready to dive in! Much more than a pool, more than a recreational facility, the Kingsport Aquatic Center offers water fun for everyone, for all ages and abilities. Our facilities and programming are designed to help our community stay fit and have fun. Kingsport is proud to hold RIACC, a non-profit group promoted to religious activities of inclusion and “peace love justice and harmony” all based on Indian philosophies. Their Amy Community center is a support hall of worship built for multiple faiths. Kingsport offers a truly astounding array of occasions to play, celebrate, and learn. From such popular annual events as the Santa Train and Fun Fest to show-stopping weekly celebrations of the arts; from living-history displays to the latest in modern pastimes; and from peaceful outdoor recreation opportunities [like 44 acres of public walking trails within our city] to wide-open adventure at nearby Bristol Motor Speedway, we warmly invite you to explore some of the lifestyle extras our citizens enjoy that make “Tennessee’s Bright Spot” so radiantly fulfilling. 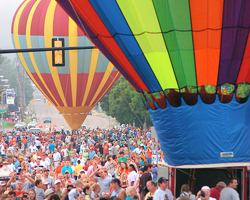 Kingsport boasts a tremendous variety of cultural opportunities to suite almost every taste. From theaters to museums, our bright city offers its citizens affordable access to a consistently entertaining variety of artistic expressions. Located in beautiful Kingsport, Tennessee, this 3500 acre nature preserve features a 44 acre lake, Nature Center, Farmstead Museum, and a spectacular Planetarium Theater with a 40 foot diameter dome. The park programs are an integral part of the curriculum. If there’s one thing that’s true about Kingsport, it’s that our citizens truly embody the Volunteer Spirit. We invite you to explore the many ways in which this radiant community loves to lend a helping hand. Gourmands of every variety will find culinary choices fit for royal appetites here in Kingsport. Click on Kingsport’s interactive calendar to locate an amazing array of activities here in our bright city– you’ll be pleased to find how many will appeal to you and your family. Kingsport has a truly exciting story to tell about life on the early American frontier, and we’ve placed a high priority on preserving our past for future generations in an accessible, entertaining way. Whether you are a first time bird watcher or a seasoned ‘birder’ the Kingsport Birding Trail, or KBT, is a fun and convenient way to explore some of east Tennessee’s richest natural treasures. Our very own rookie affiliate baseball team plays in the 2,500 seat Hunter Wright Stadium. They play 68 game season with 34 of those being home games from June until August. Kingsport Mets were Appalachian League Champions in 1988 and 1995. Any nature-lover will feel right at home here in our bright city. 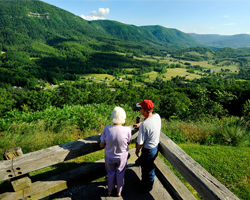 Kingsport [the only city in America that encircles an entire mountain, which is in itself one of the nation's largest city parks] offers thrillingly-quick access to many scenic wonders. Kingsport offers dedicated shoppers a delightful array of “retail therapies.” Whether you’re interested in antiques, boutiques, or anything in-between, you’re sure to find what suits you here. Move to Kingsport - Coty Sensabaugh from Kingsport Chamber on Vimeo. M2K - Natu & Bharti Patel from Kingsport Chamber on Vimeo. Move to Kingsport - Bob Miller from Kingsport Chamber on Vimeo. Move to Kingsport - Jessica Hatfield from Kingsport Chamber on Vimeo. Request your relocation guide here!